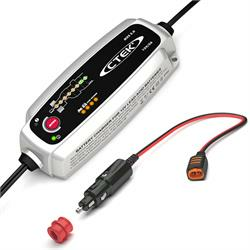 CTEK MXS 5.0 12V Battery Charger & Cigarette Lighter Adapter Kit. The cigarette lighter adapter offers quick and easy connection to the battery without having to lift the bonnet. Ideal for batteries situated in those hard to reach areas! Please note the 12v socket must be permanently live to allow for charging using this method.